Venezuelan military officers blocked a bridge on the border with Colombia ahead of an anticipated humanitarian aid shipment, as opposition leader Juan Guaido stepped up his challenge to President Nicolas Maduro’s authority. Earlier Tuesday the opposition-dominated National Assembly had warned the armed forces, which make up much of Maduro’s power base, not to cross a “red line” by blocking aid. Venezuelan military officers used a tanker truck and huge shipping container to block access to the Tienditas bridge, which links Cucuta, Colombia to Urena, Venezuela. Franklyn Duarte, an opposition lawmaker from the border state of Tachira, said that troops from the armed forces were blocking the crossing. 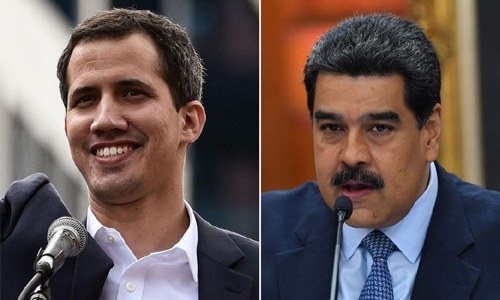 The aid delivery was being coordinated by Guaido, who has declared himself interim president of the oil-rich country and now enjoys the backing of some 40 countries as Venezuela’s legitimate leader. Maduro, 56, has repeatedly accused the United States of fomenting a coup. The US, which has not ruled out a military intervention in crisis-wracked Venezuela, was the first to recognize him as acting president, followed by a dozen Latin American countries. In his State of the Union address Tuesday night, President Donald Trump reaffirmed US support for Guaido, saying “we stand with the Venezuelan people in their noble quest for freedom.” Britain, France, Germany and Spain were among 20 EU nations to side with Guaido this week after Maduro ignored their demands that he announce new presidential elections by February 3. Guaido, 35, claims his legitimacy from the constitution and has been ramping up pressure on Maduro by calling his supporters out into the streets. The next mass demonstration is due for February 12. Guaido must still find a way to bring in the humanitarian aid given the military’s loyalty to Maduro. He accused the military on Monday of planning to divert aid being stockpiled in Colombia, Brazil and an unidentified Caribbean island, in order to distribute it through the socialist government’s subsidized food program for its own supporters. Maduro disclosed Monday that he sent Pope Francis a letter seeking help in mediating the country’s crisis. The pope told journalists Tuesday that this would require agreement from both the government and the opposition. “Getting close to both sides to enact the possibilities of dialogue. That’s how diplomacy works,” the pope said on the plane bringing him back from the United Arab Emirates.